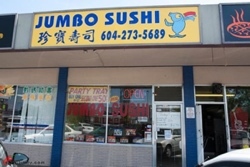 Jumbo Sushi Restaurant, 6648 No. 3 Road, Richmond, BC - THANK YOU FOR YOUR PATRONAGE. WE ARE NOW CLOSED AS OUR LEASE HAS EXPIRED. IT WAS A PLEASURE SERVING EVERYONE WHO CAME IN.